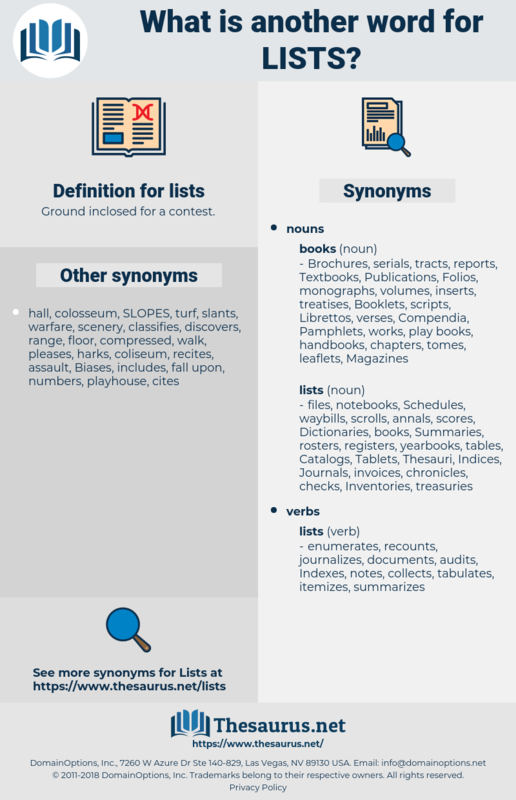 What is another word for lists? Ground inclosed for a contest. 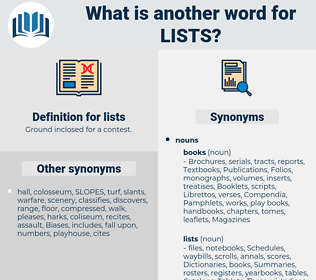 blacklists, shortlists, playlists, finalists, printlists, rosters, enumerations, catalogues, slates, Indexes, menus, checklists. contains, Containing, personality, contain, specimen, standard, clusters, current, currents, common, sampler, exhibition, ongoing, example, Charities, routine, preview, software, Shown, Las, Copies, chief, MERX, flow, flows, Has. LISTSERVS, registered, paylists, credentials, registers, registrations, included, relations, letters, authorities, specifications, archives, Categories, credits, considerations, qualifications, circumstances, submits, inscriptions, singles, tables, establishes, Registries, relationships, mentions, titles, Transplants, involves, nominations, denotes, introduces, indications, references, candidatures, Appendices, encompasses, situations, valuations, statements, applicants, purposes, receipts, signifies, Publications, registrants, documents, demonstrates, posts, Aspirations, indictments, files, defines, combinations, Qualities, applications, delivers, structures, preparation, preparations, dissemination, items, individuals, pinpoints, instances, Appointments, Identities, passport, Regulations, orders, revelations, Scales, procedures, candidates, readings, prostitutes, presents, refers, rates, elections, papers, tells, affairs, slips, ballots, prepares, appears, statutes, by-laws, signals, Surveys, leaflets, searches, Entries, tariffs, cards, printouts, batches, Permits, ordinances, brings, enrolled, examples, programmes, sheets, acts, data, rules, rolls, streams, features, ranks, pools, Activities, sets, Clients, voters, Measures, exhibits, points, queues, electors, Watches, covered, banks, logs, Patients, regimes, discusses, types, packages, Ones, Keys, signs, Roles, returns, Maps, Forums, annexes, leads, paints, fixes, counts, books, B, offers, LINEs, offices, -rrb-, holds, Parties, Fees, Areas, kinds, contains, deals, means, cases, Forms, women, keeps, currents, Las, names, flows, indicates. illustrated, demonstrated, reflected, underscored, revealed, proved, exhibits, Indicated. consists, suggests, selects, illustrates, Including, testifies, Indicating, outlines, stipulates, status, consolidates, detail, highlights, represents, describes, summarizes, rosters, contemplates, integrates, compiles, constitutes, summarises, articulates, discloses, forecasts, catches, comprises, registers, populates, hosts, corresponds, reiterates, itemizes, anticipates, entails, replicates, supplies, excludes, prescribes, emphasizes, instructs, determines, showcases, class, cites, emphasises, explains, enshrines, Addresses, clarified, clarify, clarifies, recognises, encloses, tackles, collects, announcement, considers, elaborates, recites, contributes, imposes, submits, relates, gathers, reflects, declares, sees, follows, reinforces, advises, disays, establishes, proposes, reviews, informs, foresees, understands, enables, quotes, envisages, reproduces, depicts, implies, underscores, formulates, hits, Recalls, prints, develops, mentions, asserts, recognizes, intends, reminds, stresses, examines, pits, Tracks, enunciates, involves, ties, reveals, retains, maintains, combines, speaks, underlines, compares, expresses, requires, believes, directs, predicts, denotes, introduces, dictates, references, wishes, encompasses, stands, repeats, embodies, Grants, expects, signifies, des, plans, classroom, says, serves, exposes, fails, observes, demonstrates, extends, announces, posts, builds, prompts, uses, feels, allows, captures, seems, files, defines, adds, creates, resumes, delivers, raises, calls, concludes, Houses, pinpoints, poses, affords, regards, Gives, yields, renders, embraces, presents, Comes, refers, produces, tells, teaches, mirrors, moves, opens, occurs, finds, is, looks, covers, prepares, appears, Carries, argues, proves, adopts, marks, signals, relies, pays, packs, brings, reads, falls, puts, draws, features, takes, ranks, sets, Bears, exhibits, points, tries, echoes, Watches, logs, discusses, returns, Does, leads, paints, counts, offers, -rrb-, holds, contains, deals, means, makes, Forms, Has, indicates, insert. contents, compilations, Constituencies, Catalogs, Formularies, samples, tickets. That work was soon over, and the girls had not long to remain in suspense before the lists were ready. No; I am far too eager to see my name in fashionable lists. leg it, loquat, look out, legate, lightheaded, lookout, like a shot, lygaeid, logwood, low-set, locust, licit, listed, leucocyte, locustidae, least, low-keyed, laxity, light, liquid, licked, lygaeidae, look to, liszt, lcd, leucothoe, lichgate, lowset, lost, loyalist, legged, ligate, lightwood, lycosidae, light diet, locked, located, luck out, luck it, light-headed, liquidity, liquid diet, locket, Lego set, lock out, look at, lucidity, lowest, lacewood, lay aside, low-cut, lactaid, logic gate, lusty, lust, leukocyte, lee side, luxate, lay waste to, lakeside, legatee, loquacity, lawsuit, lychgate, locate, lockout, lose it, locusta, lucid, low-cost, Lakota, laced, light-duty, lsd, lucite, lac dye, lighted, liked, last day, log out, lock-gate, Lake Tahoe, locoweed, last, lake chad, leak out, lose weight, lash out, liquidate, likuta, laugh at, lassitude, legato, last out, leased, Lactate, lesotho.